Urban Initiatives – Team UI Runner Profile: Meet Gene! Team UI Runner Profile: Meet Gene! Daylight by Matt and Kim has consistently been on my running playlist for about a decade now. I was invited to an Urban Initiatives event by Jason Batliner as he is a member of the Associate Board. The event was a Friday afternoon scrimmage for 4 Work to Play schools and I was very impressed with the Urban Initiative staff’s organization and leadership. Since then I decided to join the Associate Board and have participated in many events with Urban Initiatives! I was an athlete growing up and continue to enjoy running for recreation and exercise. 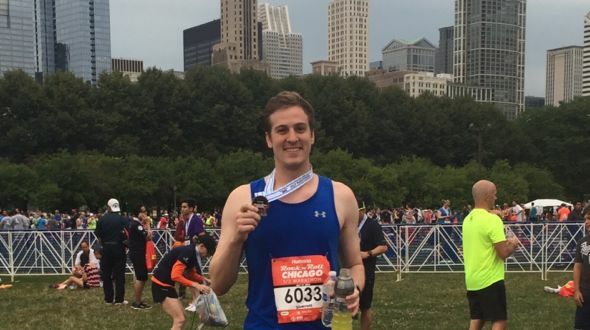 The Chicago Marathon has been a bucket list item for me as a Chicago resident and the opportunity to run with the Urban Initiatives team and raise money for the organization has motivated me to sign up for the 2016 race. The summer tends to be a very busy season for me with vacations, Holidays, and other activities going on during the weekend. My biggest challenge has been blocking off the time to get out on the long runs. One way I’ve helped to make this easier is running half marathons with a few friends. By doing this I’ve broken down the training into different sections and have friends to share the journey / competition with! Previous Article: Team UI Runner Profile: Meet Ryan!